I had a plethora of sesame seeds in the freezer, having bought a 16-oz. bag of Ziyad Brand, mainly so I could throw a teaspoon or so on top of my bread when I make it. So when I was looking for a new cookie recipe, Sesame Seed Wafers from Nick Malgieri's Cookies Unlimited seemed like a good idea. There were three fried-chicken style buckets, full of what looked like room temperature, solid ice cream. That's the best way I can describe it. One was plain, another had chocolate marbling throughout, and the third had bright green pistachios in it. Not being familiar with halvah, my siblings and I were reluctant to try it. But my dad brought them to the table one night after dinner and started carving out pieces and handing them around. I took a little nibble from the plain one and was hooked. Soft, crumbly and chewy all at the same time. Sweet, but not too sweet, with a slightly bitter accent that brings it all together. The chocolate marbled was interesting and the pistachio was the most intriguing (it was my first taste of those, as well, and in the day when most pistachios were dyed red so I didn't even recognize them as pistachios). But the plain was, and remains to this day, my favorite. I don't have it very often, mostly because I don't think to go looking for it at the store. 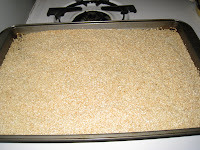 Since I had so many sesame seeds on hand, it seemed like a no-brainer to try out the recipe. 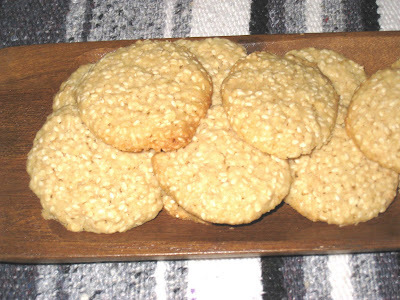 The first instruction in the recipe was to toast the sesame seeds. It's amazing how 1-1/4 cups can completely fill a cookie sheet. I was a little nervous that I would spill them, but I was careful and everything went smoothly, except for the few seeds that spilled into the oven. I had a little trouble chasing them, but I wanted to make sure I got them out because I didn't want to smell burning sesame the next time I baked something. You can see how many seeds there are once the batter is mixed up. The batter is light and fluffy, and was not at all hard to make. I was eager to see how well they would perform in the oven. It was quite easy to get the cookies onto the baking sheet. I used two regular spoons - one to scoop up the batter and the other to push it off the first spoon. 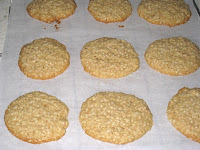 They weren't terribly sticky, so it was also easy to flatten the tops of the cookies, as directed by the recipe. I wasn't sure how they would bake, but they flattened out quite nicely into lovely rounded wafers. It was hard to wait for them to cool off enough to taste. When I did taste them, hoo boy were they delicious! Soft, chewy, and chock full of sweet sesame flavor. I gave some to Bob and he also loved them. He thought they would make excellent ice cream sandwiches, and I think he is on to something. I will have to experiment with that next time I make them. These were definitely good enough to make again. They're easy to make, they don't take long, and they are delicious. They were as good the last day (I think they lasted three? four? days) as they were the day I baked them. These are the first cookies I have made from this book. I noticed that there are almost as many negative as positive reviews on Amazon. I marked several more to try, so I will see how it goes. I did not run into any problems with this recipe. Set the racks in the upper and lower thirds of the oven and preheat to 325 degrees. Place the sesame seeds on a jelly roll or roasting pan and toast them, stirring occasionally, until they are golden, about 10 minutes. Pour the seeds onto a cold pan to cool. In a bowl, combine the flour, baking powder, and salt; stir well to mix. Stir in the cooled sesame seeds. In the bowl of a standing electric mixer fitted with the paddle attachment, beat the butter with both sugars on medium speed until well mixed, about 30 seconds. Beat in the vanilla, add the egg, and continue beating until smooth again. 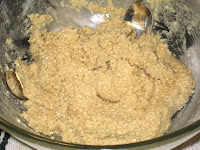 Remove the bowl from the mixer and stir in the flour and sesame seed mixture with a large rubber spatula. Drop teaspoonfuls of the dough 2 or 3 inches apart on the prepared pans. Before baking the cookies, flatten them slightly with the back of a fork or a small spatula. 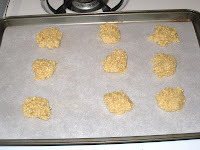 Bake the cookies for 10 to 12 minutes, or until they spread, become firm, and are lightly colored. Slide the papers off the pans onto racks. After the cookies have cooled, detach them from the paper and store them between sheetes of parchment or wax paper in a tin or plastic container with a tight-fitting cover. from Cookies Unlimited, by Nick Malgieri (HarperCollins Publishers, 2000). These cookies looks so yum and inviting, loved it ! Thanks, Usha. They are really good, and very easy to make. Next time I make them I am definitely going to play with the ice cream idea. I love the sesame seeds in it. They looked so delicious. I would love to try making them. You should definitely make these if you have the chance, cribs. They actually taste even better than they look!